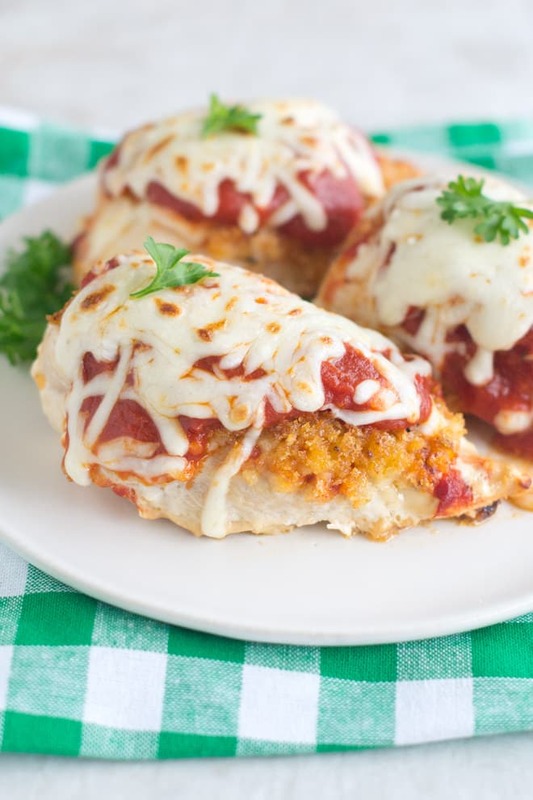 Learn how to make delicious Chicken Parmesan using frozen chicken breasts. Quick and convenient for busy weeknights. My newest favorite thing is cooking fish fillets and chicken breasts straight from frozen. Why? Well, I don’t have to decide ahead of time what we’re having for dinner. When I’m ready to cook, I just reach into my freezer and grab what I’m in the mood for. It’s great. I figured out a little while ago how to cook fish fillets from frozen and then how to cook chicken breasts from frozen. Both methods work great. Since then I’ve been riffing on the methods, coming up with more recipes, especially frozen chicken breast recipes. 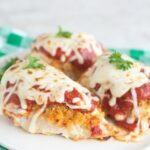 The one I’m sharing today is a true family favorite: Chicken Parmesan. How can you go wrong? Chicken, crunch breadcrumbs, tomato sauce and melted cheese. Yes. So good. Before you get to the cooking, it’s important to freeze your breasts correctly in the first place. You need to make sure that your chicken breasts were originally frozen individually. If you bought them frozen, they should be all separate in the bag. You’re golden. If you bought them fresh, they probably came all squished together in a pack. You need to take them out of there and freeze them individually, in a single layer and not touching on a pan. Then, once frozen, transfer them to a ziptop bag. Then to make the Chicken Parmesan, here’s what you do. Get out the breasts and put them on a lightly oiled baking sheet (I really like this one. It’s thick and sturdy and holds up to the high temperature that the chicken is cooked at). Spread a bit of tomato sauce on each one. Top that with a panko breadcrumb and oil mixture. Bake at 425ºF until breadcrumbs are brown and chicken is cooked through. 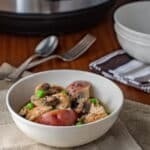 Take the chicken out of the oven and preheat the broiler. Top each breast with some tomato sauce and then some mozzarella cheese. Put it under the broiler just until the cheese is melted. And then eat. In a small bowl combine panko, 1 tablespoon cooking oil, salt, black pepper, garlic powder and Parmesan cheese. 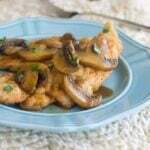 Place chicken breasts on prepared pan and brush the top of each with about 1 teaspoon of tomato sauce. Top each with one quarter of the breadcrumbs. Remove from oven and preheat broiler. Top each breast with 1 heaped tablespoon of tomato sauce and 2 tablespoons of shredded cheese. Broil until cheese is melted, 2-3 minutes. *If using thawed or fresh chicken breasts, bake at 450ºF until cooked to 165ºF, about 20-25 minutes. Then proceed with step #5. Disclosure: This post contains an affiliate link to Amazon. If you click it and buy something over there, I get a small commission. This is at no additional cost to you. All opinions are my own. This is great! I’ve also used the same technique for cheddar/ranch chicken: use ranch dressing in place of tom sauce & cheddar cheese in place of the mozzarella. Now, I want to try the taco chicken suggested by another commenter. Sharon, That sounds delicious. I’m going to give it a try! How was it, Jason? Sounds great! Sounds great! Just want to clarify, panko mixture only goes on top of chicken (not bottom)? Also, do you bake uncovered? Thanks! Carrie, Yes, just on the top. When the chicken is frozen like that you can’t really get it to adhere to the bottom properly. And yes, bake it uncovered. Great technique. The Chicken Parm was really good and so easy. I used the same technique to make ‘Taco Chicken’. I substituted salsa for the tomato sauce, taco seasoning for the spices and shredded Monterey jack for the mozzarella. It was fantastic! Rick, That sound fantastic. I might just have to put it on my blog some time soon. Have a great day! I think your recipes are great Christine. 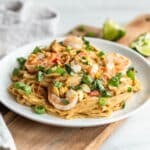 I don’t know how I came across your website, some food recipe googling I guess. This Parmesan Chicken was a big hit with me for it being quick and nutrition and with my family for it being tasty. I also made your quinoa and cauliflower yesterday as I decided a meat free Monday was a good idea, although my 16 year old carnivorous son moaned a bit. Many Thanks, I will be a regular visitor to your site. Frances, Thank you so much for your lovely comment. I appreciate the feedback and am delighted that you and your family have enjoyed my recipes. Have a great day!